The Rocky Mountain wood tick is a creature that prefers shrubs over open areas but would venture into areas where hosts of small or big mammals may be found. It may also be found on foothills that are lightly wooded and on trails located on lower elevations. Colorado tick fever in humans. Rocky Mountain spotted fever (RMSF) in humans, dogs and cats. Ticks paralysis (although rare) in pets and humans. Tularemia (Francisellatularensis) in humans, cats, dogs and other hosts. 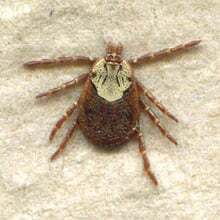 In the United States, these ticks are generally found in the patched areas of South Dakota, Nebraska, New Mexico and Arizona. They are also reported to dwell in some parts of the Sierra Nevada mountains in California. With the scientific name Dermacentor Andersoni, these ticks, just like most ticks in general, have a 3-stage life cycle. It takes about 1 to 5 weeks before larvae are hatched from eggs. How active they become depends on their location. They start around March down south up until October up north. They can feed for 8 days straight, preferring rodents but are able to survive up to more than a hundred days without feeding. Once they are replete, they simply drop from their host to the ground and await their development to become nymphs, a process which takes about 1 to 3 weeks. At this stage, the Rocky Mountain wood tick rarely attaches itself to humans, preferring rodents or other smaller mammals instead then feed to satiation. It detaches itself from its host after it is fully fed then wait to become an adult tick, sometimes in as short as 14 days. They are active from March through October but can survive without a meal for up to 10 months especially during unfavorable conditions in its surroundings. Both the male and female adult ticks are commonly active nearing the end of spring to the early days of summer. However, those in the higher elevation can be active from January to November. Other groups found in the westernmost areas of the mountain region begin activities in April and May. The male ticks’ feeding time is shorter compared to that of the female just so it can support its spermatogenesis needs. The pregnant female wood tick requires up to 17 days of feeding before it detaches itself from its host, fall to the ground and lay thousands of eggs. These ticks are color brown or reddish brown. Females are with a distinctive dorsal speckled with some silvery gray pattern that turns darker as it feeds. Male ticks can be identified by their gray and white spots. The bodies of the wood ticks have the shape of a flat pear, about 2mm to 5mm; females up to 16mm when fully engorged. Male wood ticks would feed to initiate their process of reproduction and would disrupt that feeding to mate sometime in their third and last stage. Their mating system allows polygyny hence their substantial multiplication as each female can lay thousands of egg at a time. Female wood ticks send the signal of their readiness to mate by releasing: 1. dichlorophenol – as announcement to male ticks that they are female potential mates; 2. cholesteryl oleate – an indication that they are willing to mate. The mating season for the Rocky Mountain wood tick is typically from May to June once they have reached sexual maturity which takes about a year. It may vary though for some groups because of the changes in their surroundings. While females are able to lay countless eggs, it is only one breeding season for them for they die after mating. How long the dermacentor andersoni specie lives is affected by several factors including the availability of hosts to feed on. There are long periods that then can survive without blood meal from different stages but under normal circumstances, it could be 3 to 4 years.